Several F-Zero racecars on the Mute City stage. Pictured: Mighty Gazelle's Red Gazelle (#1) and Draq's Mighty Typhoon (#27). The F-Zero Racers are the 30 racing machines featured in the 1998 futuristic N64 racing game F-Zero X, and they all make appearances together in Super Smash Bros. Melee, Super Smash Bros. Brawl, and Super Smash Bros. 4. The F-Zero Racers appear together in several instances of the game's environments. In addition, they appear on some of the game's trophies, and Captain Falcon's Blue Falcon and Samurai Goroh's Fire Stingray are seen in heated racing combat in the game's opening movie. Aside from the opening and some of the trophies, the machine's models are the original polygonal models used for the N64 racing game. In the Adventure Mode, stage 8 is the F-Zero Grand Prix, and the character must navigate the track and cross the finish line on foot while the 30 racers zoom along the cycling track. They can be visible in the background, and a warning appears to inform the player to take refuge on a nearby platform before the racers linearly charge through in the foreground, like on the Onett stage with the cars. The character will receive massive damage (32%) and knockback if hit by the machines. A sped-up, more difficult version of this stage in which the player controls Captain Falcon in Event 33: Lethal Marathon. The racers appear on both F-Zero-themed stages that are selectable for multiplayer. In Mute City, the stage takes place on platforms that travel along the first track of F-Zero X, Mute City, and it lands onto the ground at set intervals. The 30 machines will race each other on the track in the meantime, and at times they will race through the battling area from the background while the platforms are landed on the track. Though the machines in this stage are depicted smaller than in other stages, characters will receive 12% damage and knockback from coming into contact with them nonetheless. These machines can be damaged and eventually become smoldering wrecks by their ramming each other along the track and if characters' attacks just so happen to connect with speeding racers passing by. In Big Blue, one of the most unique stages in Melee, the battling takes place on larger versions of the F-Zero racers themselves as they speed along the track horizontally and the foreground and background pass by to the left very quickly. The randomly-selected assortment of machines will speed along at consistent speeds and function as disconnected platforms more or less, while other platforms and objects such as the Falcon Flyer will cruise along with the moving stage above the racers. 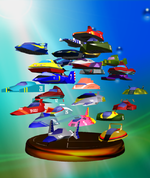 The F-Zero Racers trophy is unlocked by completing Adventure Mode with all characters. In the year 2560, an association of wealthy space merchants created the F-Zero Grand Prix in an attempt to add some excitement to their opulent lifestyles. The jet-powered racers have no tires, but use G-Diffuser systems to float a foot above the surface. Many believe the F-Zero championship is the highest claim to fame in the galaxy. In addition, more detailed models of the Blue Falcon, White Cat, Golden Fox, and Fire Stingray appear alongside enlarged models of their respective pilots on the Classic Captain Falcon trophy, Jody Summer, Dr. Stewart, and Samurai Goroh, respectively. The racers appear at Port Town Aero Dive in Brawl as hazards, similar to their appearance in Melee. This time, however, they are faster and more powerful than they were in Melee, KOing players even at lower percentages. Furthermore, they are now indestructible. Big Blue also returns from Melee, as well as the racers from that stage. A similar stage hazard are the Shy Guys on Mario Circuit. The original four F-Zero Racers appear alongside generic F-Zero Racers in Super Smash Bros. for Nintendo 3DS on Mute City as platforms that may race off the screen, using their original SNES sprites. They also appear as standalone trophies using their SNES sprites along with driver trophies with 3D models of the cars behind them, like the Melee and Brawl character trophies. In Super Smash Bros. for Wii U, the F-Zero GX Racers reappear in Port Town Aero Dive. The F-Zero Racers once again return, by the comeback of past stages Port Town Aero Dive, Mute City SNES and Big Blue. Fifteen of them (counting Captain Falcon) also appear as Spirits, and Pico's Wild Goose appears as a form of transport in World of Light. This page was last edited on January 15, 2019, at 05:58.